These are things that you will learn while at BMT. Learning them before will help you. Some trainees have been known to "trade" their knowledge with others. You can teach them their Creed, they can teach you how to make your bed correctly. At the position of attention, knock (a single time) on the door of the superior you are reporting to. If the door is open, knock (a single time) on the door frame. At the command of "enter," march smartly to a position three paces in front of, and centered, of the superiors desk. Stand sharply at attention. If the superior is a commissioned officer, salute, and hold the salute while making the reporting statement. Hold the salute until the officer returns it. If you were ordered or requested to be there, the reporting statement should be "Sir (or "Ma'am"), Sergeant Johnson reports as ordered." If you were not ordered to be there, the reporting statement should be "Sir (or "Ma'am") Sergeant Johnson reports." How to do a proper hair bun: The females are allowed to take get product to keep their hair in place such as hair crack, gel or other product to help with fly-a-ways. PLEASE practice. Bobby pins must be as close to natural color of hair as possible. The 341. 341= You'll learn all about the AETC Form 341 in Air Force Basic Military Training. 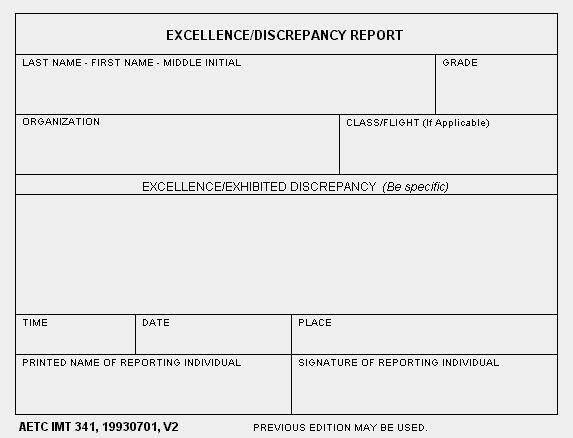 This is the primary method the Air Education and Training Command uses to document discrepancies and excellence for non-prior service recruits in both basic training and Air Force Technical Schools.